You’re probably used to seeing Gisele Bündchen look a certain type of way on the cover of magazines. Take, for example, the Brazilian bombshell looking every inch the supermodel on Vogue Japan‘s February cover last month and in the new Versace campaign. 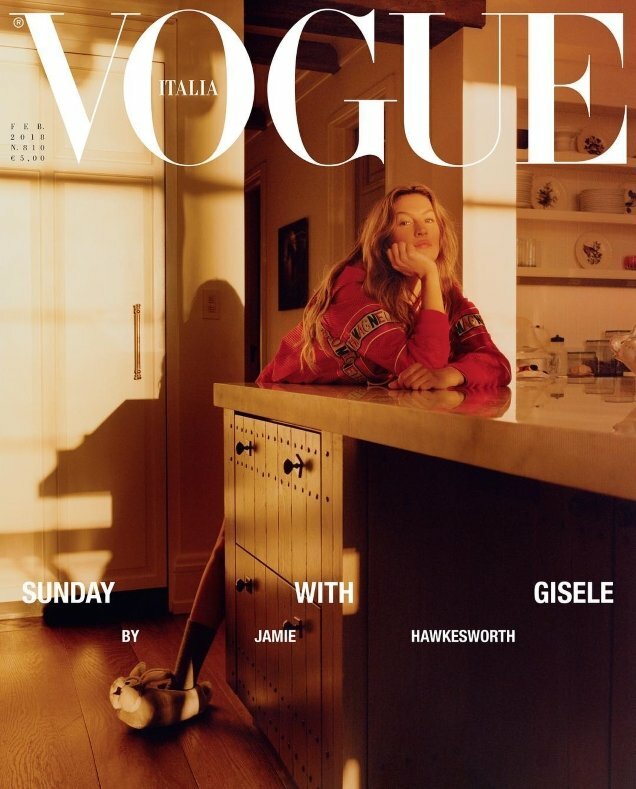 Now, posing as never before, the model opened up her family home one lazy Sunday to photographer Jamie Hawkesworth, who shot Gisele in comfortable surroundings for two inviting and intimate covers of Vogue Italia’s February 2018 issue. Despite the magazine’s recent decline in standards, our forum members were in awe this month. “This is probably the first new Vogue Italia cover I liked. Gisele is so iconic,” said marsnoop2 the second the first cover (above) came to light. “Love the fact that it doesn’t look like a fashion magazine cover, and looks very cozy and comfy, I like it,” wrote Your Anchor. “Oh, I really like it. The simplicity works and Gisele looks flawless,” approved RanThe. “I also love this, but probably because it’s Gisele. Very fresh-faced and an unexpected cover for her since she has been going for the glamazon look for years,” voiced dodencebt. However, the cover wasn’t catering to everyone’s tastes. “It’s a beautiful and unguarded shot at face value. Jamie did a great job for his first Vogue cover. Unfortunately, it doesn’t look anything like Gisele, the angle reminds me of her Porter cover, and a hoodie? Really, VI? This is a fashion magazine!” scolded Benn98. Await more from Vogue Italia’s February issue and share your thoughts on the two covers here.